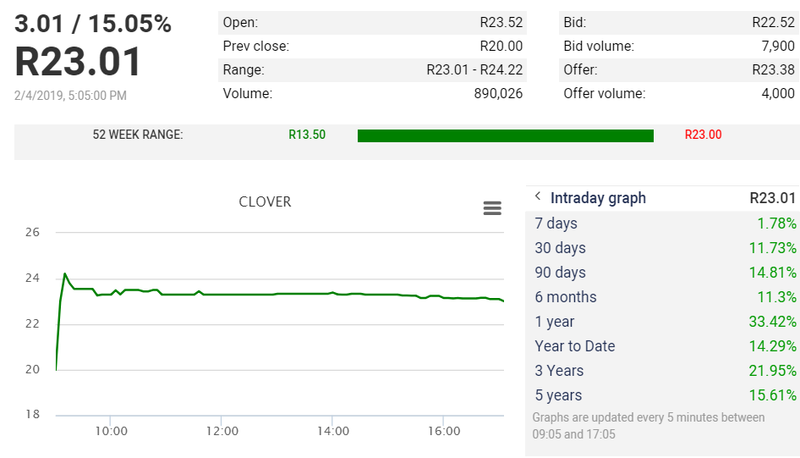 We take a quick look at Clover after their SENS announcement today in which they state that Milco SA has decided to make an offer to buy all Clover shares at a price of R25.00 per share. ​Needless to say the price shot through the roof after the announcement. We take a look at the announcement and the share price reaction below. So those who dont know anything about Clover. The information below was obtained from their website. To be a leading branded foods and beverages group in South Africa and selected African countries. And to provide accessible nutrition to all consumers. To reach the group’s widely dispersed customers daily, and to provide trusting consumers with quality products through our extensive network. We take care to develop or acquire brands which have the potential to occupy the number one or two position in its chosen segments. To focus on way better operations across the supply chain including services to the trade, and to deliver sustainable shareholder value by being a responsible corporate citizen and preferred employer. ​Clover’s corporate strategy is to build onto existing competencies within the Group and to establish a culture of exceptional performance with a view to set a platform for future market expansion. Different companies within the Group have different strategies, all receiving company-specific support to maximise their potential. Key to all its activities is the expansion of capacities to share in the strong growth in consumption in the segments which it dominates. Further to the cautionary announcement released on the Stock Exchange News Service (“SENS”) of the JSE Limited (“JSE”) on 19 October 2018 (“Cautionary Announcement”) and the subsequent renewal of the Cautionary Announcements released on SENS on 30 November 2018 and 21 January 2019, shareholders of Clover Industries Limited (“Clover”) (“Shareholders”) are informed that Clover has entered into an implementation agreement (“IA”) with Milco SA Proprietary Limited (“Milco”), in terms of which Milco will make an offer to acquire all of the issued shares in Clover (on a fully diluted basis, such that thereafter there will be no remaining rights exercisable or convertible into shares) (“Clover Shares”), by way of a scheme of arrangement (“Scheme”) in terms of section 114 of the Companies Act, No. 71 of 2008, as amended (“Companies Act”) between Clover and the Shareholders. The amount payable in terms of the Scheme will be a cash consideration of R25.00 per Clover Share (“Scheme Consideration”), subject to the terms set out in paragraph 5 below. Clover has established an independent board of directors ("Independent Board") for purposes of the Scheme and related matters (the “Transaction”), including, evaluating the terms and conditions of the Scheme and advising Shareholders thereon as required by the Regulations promulgated under the Companies Act ("Companies Regulations"). The Independent Board comprises Dr. Steve Booysen (as lead independent director), Dr. Whitey Basson, Ms. Neo Mokhesi, Mr. Flemming Morgan and Ms. Babalwa Ngonyama. Pursuant to paragraph 1.17(b) of the JSE Listings Requirements, all the Clover Shares will be delisted from the Main Board of the JSE and the Namibian Stock Exchange (“NSX”) pursuant to the implementation of the Scheme (“Delisting”). The purpose of this joint firm intention announcement (“FIA”) is to, inter alia, advise Shareholders of the terms and conditions of the Transaction. 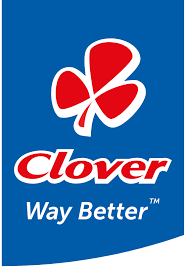 Clover is a leading and competitive branded consumer goods and products group operating in South Africa and select African countries reaching a wide range of consumers with a range of quality value-added dairy and non-dairy products. Clover has one of the largest ambient and chilled distribution networks in Southern Africa. The Company’s segments include: dairy fluids, dairy concentrated products, ingredients, non-alcoholic beverages, fermented products and other products. Clover’s footprint extends across South Africa and sub-Saharan Africa, with the Company employing over 8,500 employees. Milco has been formed to act as the Offeror in the proposed Scheme. Immediately following the Scheme operative date, the shareholding of Milco will be held as follows: - c.78.7% by Milco Mauritius International Limited, a Mauritian holding company, the Milco shareholding of which will, in turn, be effectively held c.59.5% by International Beer Breweries Limited ("IBBL"), c.8.3% by IncuBev Limited (“IncuBev”) and c.10.9% by Ploughshare Investments Limited (“Ploughshare”); - 15% by Brimstone Investment Corporation Limited (“Brimstone”); and - c.6.3% by the executive management of Clover (“Management”). Particulars regarding each of IBBL, IncuBev, Ploughshare, Brimstone and Management are set out below. IBBL is a directly owned subsidiary of the Central Bottling Company (“CBC”) Group. CBC is a privately-owned international food and beverage group whose subsidiary companies serve over 160 million consumers worldwide. CBC is Israel's leading manufacturer and distributor of beverages, and, through its foreign subsidiaries, has manufacturing and distribution operations in Turkey, Romania, and Uzbekistan. CBC, which is also the owner of the Tara dairy, Israel's second largest milk processing dairy, produce and distributes its own brands and Müller brands, and it operates the license for the Müller brand in Romania. CBC also owns Gat Foods, a “grove to table” juice operation with customers in over 70 countries. In addition, CBC works closely with its international franchisors, including The Coca-Cola Company, Carlsberg, Anheuser-Busch InBev, the Müller Group and Diageo. IncuBev is an international business focused on the food and beverage sectors in sub- Saharan Africa. The shareholders of IncuBev comprise global executives with extensive knowledge, experience and relationships, both in sub-Saharan Africa and the rest of the world, in the dairy and non-alcoholic beverage industry. IncuBev has a network design with access to deep operational, private equity, banking and management consulting expertise, within sub- Saharan Africa and globally. Ploughshare is a privately owned, independent investment company which is part of a broader international investment group which has investments and expertise in retail, distribution and beverages. Brimstone, established in 1995 and listed on the JSE, is a black-controlled and managed investment company incorporated and domiciled in South Africa. Brimstone employs more than 3,500 employees in its subsidiaries and more than 24,000 employees in its associates. It has investment expertise in industries such as fast-moving consumer goods, health care and financial services, amongst others. Brimstone has an experienced senior management team with investment expertise built up over more than 20 years. Milco has strong faith in Management as evidenced by the track record of the business and will look to support them and the Company in their growth plans. Collectively, Management will reinvest a portion of the proceeds they receive from the Scheme and the cash settlement of certain of their share appreciation rights ("SARs") into Milco (the “Reinvestment”). In addition, Milco will provide funding to Management to facilitate their subscription for additional shares in Milco. Milco is confident that the continuity and achievement of Clover's business plans is assured by its ability to retain, post-completion of the Scheme, the professional, experienced services of Management. Milco believes that the combination described above brings significant operational, technical and financial capacity to support Clover’s growth strategy in sub-Saharan Africa. Definitely not a blue Monday for Clover shareholders today. With them basically making R5 a share or 25% return on their investment overnight (based on the offer price of R25 a share and if it was paid today). While the newly created Milco is offering R25 a share the legalities and administration and regulatory approvals etc will take a while (as in couple of months to finalize).